Kerr, Jane. The Elephant Thief. Boy has lived a difficult life in the impoverished neighborhoods of Edinburgh, Scotland in the 1870s. With no parents, he scrounges for food and clothing with other urchins, and is prey to petty crime lords who work him hard and treat him badly. 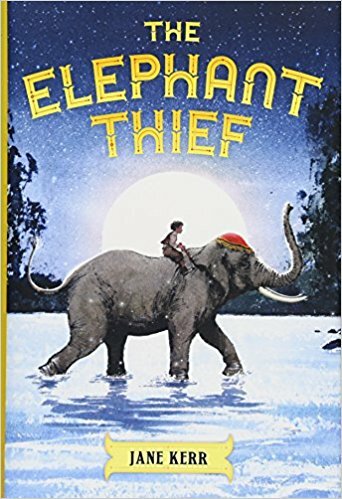 When he is found by Mr. Jameson at an animal auction, Boy's exotic, ethnic looks encourage the entrepreneur to take Boy along with him to help with his new purchase-- an elephant named Maharajah. Thinking that it would add to the drama of the story, Jameson decides that Boy (whom he names Danny) would make a great Indian prince, named Dandip. Along with Sandev, who has been working with Maharajah, Danny helps take care of the elephant, who has been mistreated by his previous owners. After making a bet with another zoo owner, Mr. Albright, Jameson is under duress to travel to Manchester, England to Belle Vue in a limited amount of time. Along the way, there is a lot of drama, some manufactured, and some not. Maharajah destroys a train carriage and a toll gate, and the group tries to cross a river. So many things go wrong that the group, which also includes a veterinarian and his daughter, begin to suspect that Mr. Albright is sabotaging their efforts, and may be aided by someone in their entourage. Will they be able to make it to Manchester in time for Jameson to win the bet and keep Maharajah? And will Danny's secret identity be revealed? I love books like Dagg's The Year We Were Famous or Blackwood's Around the World in 100 Days that discuss how difficult traveling was before or in the early days of car travel. Taking off across the countryside in the UK in the 1870s sounds appealing to me, as long as there were inns along the way to stop in. Without phones (or lights, or motorcars), adventure seems more harrowing and exciting. Pair that with an elephant companion, and who wouldn't feel compelled to run off and join the circus? Danny is put into an untenable position when he is kitted out to look like an Indian Prince. He is interviewed by members of the press, but instructed not to speak, so Hetty, the veterinarian's daughter, helps him out. He is also not allowed to speak to her, even though she is a good friend to him, and he feels badly about this. His background of poverty and abuse make him appreciate good meals, warm clothing, and comfortable beds so much, however, that he is not going to jeopardize his position in any way. The schemes that businessmen went through at this time are also interesting to read about. Truth was not necessarily part of any of it, as we see with another famous shyster of this time period, P.T. Barnum. It was all about the show. Perhaps this is a timely, if alarming, message to read today! While this is a great addition to the large body of elephant fiction that includes Morpurgo's The Elephant in the Garden, Smith's Elephant Run, Dinerstine's What Elephants Know, High's One Amazing Elephant and Walters' fantastic new Elephant Keeper, this is also a great Victorian orphan adventure in the spirit of Mary Hooper's great novels set in London, Schlitz's A Drowned Maiden's Hair, Avi's City of Orphans and (for a touch of fantasy) Jinks' How to Catch a Bogle series.